TEL AVIV, ISR. It can be said that modernism delivered two very distinct, though seemingly similar approaches to art making: the monochrome and the blank canvas. The monochrome belongs to painting, while the blank canvas belongs to the readymade – to art. Thierry de Duve historicizes these lineages as belonging to Picasso and Duchamp, respectively, in his publication Kant After Duchamp, with regard to the turn in their work, and modernism more generally, since the 1960s. Yet, it was precisely these two dated territories I thought of when I first saw documentation of Sarah Ortmeyer’s exhibition at Dvir, in Tel Aviv, entitled KISH KUSH. For better or for worse, the irresistible connection to Duchamp was made by the predominance of chess in the subject matter. Floor to ceiling reproductions of world women chess champions occupied the gallery, abstracting and obscuring the flatness of the space through their scale, while original productions of oversized marble and onyx pawns, knights, and rooks scatter the floor of the installation in clusters. 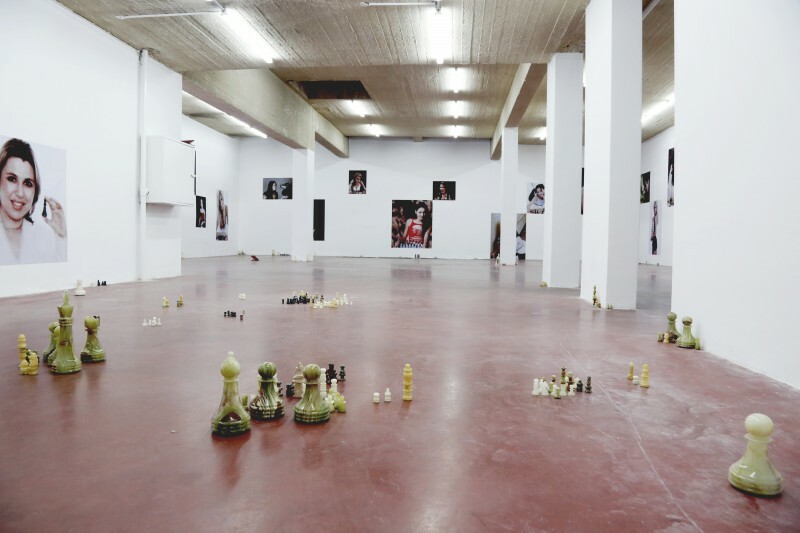 The exhibition acted like a game undone, a wild and ready synthesis dealing with a very specific symbol of source – chess itself – while being disobedient enough to purposefully misunderstand its goals. In many ways, KISH KUSH, a Hebrew term for nonsense, hinges on its formal elements, or at least its structure. One could easily argue that the exhibition deals with the figure both pictorially and sculpturally, though the women in her photographs cannot be logically objectified, since the figure mocks its own status as an object through its playfulness. For Ortmeyer, the game is transformed into ornament, meticulously adding a sense of nonchalance into a game of war strategy. The performativity within the work belongs to the artist, but is not performed by the artist, as it was with Duchamp. Sarah Ortmeyer, Grandmaster XI, 2014, Inkjet printer ink, paper, red powder blush, 120 x 87.5 cm, unique. Photographer credit: Nadine Fraczkowski. Courtesy of Dvir Gallery and the artist. So, what happens when you don’t play by the rules? The game itself is a great place to start. The ever-present black and white of the games’ materials – the grid and the players themselves – manifests in many ways, notwithstanding its symbol for offense and defense (light vs. dark; good vs. evil), but also in picturing an invisible opponent, in the sense that the experience of Ortmeyer’s work is more similar to playing against an algorithm than it is against a physical rival. The game is not within the work, but between the artist and the viewer, waiting to be activated. The installation of KISH KUSH is similarly as imagined as it is tangible; it resists transforming Duchamp’s endeavor into a gendered or feminine statement on approach by instead carving out a new history – a different lineage of art masked as method since the 1960s. Ortmeyer inserts herself into this fork in the road – between formalism and conceptual art – and comes out with a third and fourth option – of poetics and humor – mirroring the inverse of those two paths to form a crossroads. Sarah Ortmeyer, KISH KUSH, 2014, Exhibition View at Dvir Gallery. Photographer credit: Nadine Fraczkowski. Courtesy of Dvir Gallery and the artist. It seems no coincidence that the visualization of this model would take the form of two intersecting lines, a Cartesian plane (the grid of course is also the very foundation of chess). However, the readymade grid is not at all rigidly depicted in Ortmeyer’s work. These intersecting paths do also form the same symbol where one meets the devil, after all – there is certainly a cunning and deceptive quality to Ortmeyer’s strange and sensory chess world. In one image, entitled GRANDMASTER XI, 2014, a woman lies face down on what looks like a hotel room bed. Her shirt is cut low; a panel of red frames her chest, while black long sleeves cover her arms – her legs are bent upward and delicately crossed, and black patent leather heels remain on her feet. 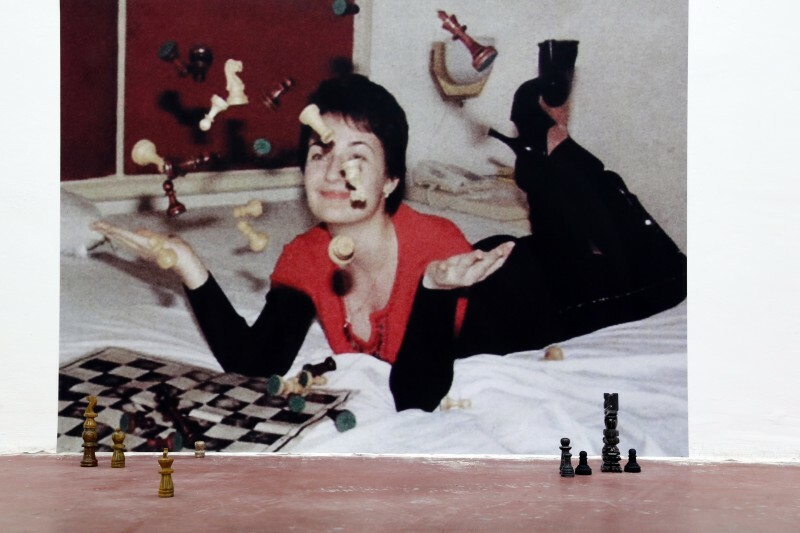 To her right, a flexible plastic chessboard rests conforming to the soft surface of the sheets, though the pieces are not on its surface, but in the air – juggled, or rather suspended, in an enchanted arch. Her vacant yet amused gaze is visible through the hanging players, a tender moment of access in the otherwise static and tense atmosphere. Is this a frozen frame or has she halted these pieces, charmed them into a scattered composition before her eyes? The supernatural affect of Ortmeyer’s pursuit counters the cold marble touch of the monochromatic grid, rendering the figures – not only the miniscule stone pieces, but also the monumental, statuesque representations of the women – unstable and loose. Female representation in art has a habit of behaving that way. 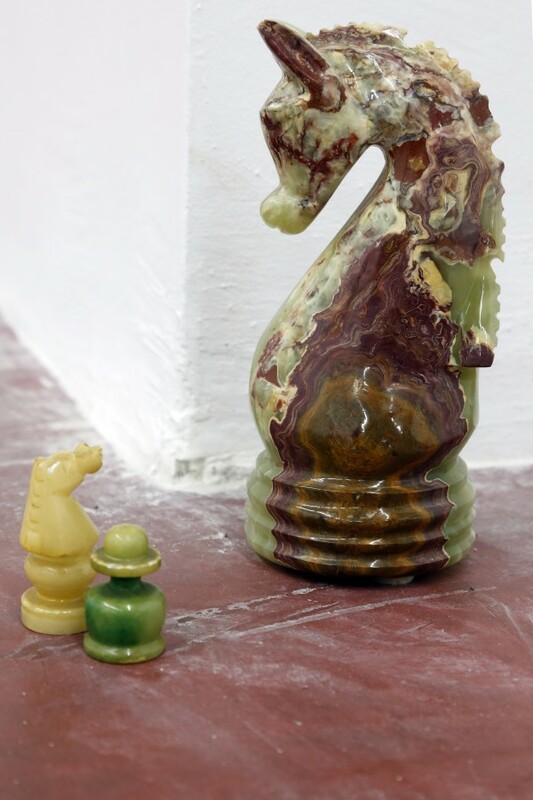 Sarah Ortmeyer GRANDMASTER I-XII, WORLD CHAMPION I–IX: Inkjet printer ink, paper, red powder blush, 2014; KISH KUSH: Marble, onyx, 2014; MAGNUS MAGNET: Chess magazines, cardboard, linen, one star ping pong balls, 2014, exhibition view at Dvir Gallery. Photographer credit: Nadine Fraczkowski. Courtesy of Dvir Gallery and the artist. This betrayal of expectation is not new subject matter for Ortmeyer. 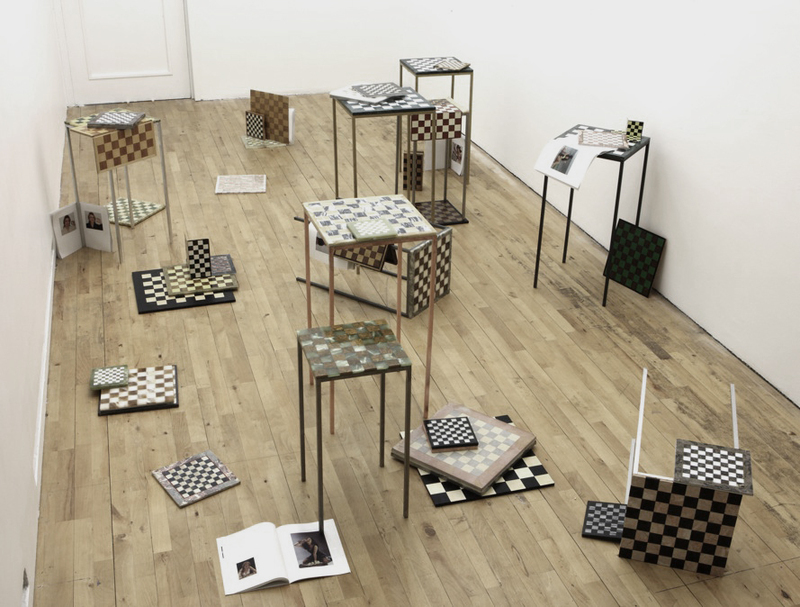 In Ortmeyer’s exhibition at S.M.A.K., in Gent, Belgium in 2012, a room full of stilted chessboards turned into small and narrow tables are strewn about the gallery, falling on top of one another in controlled chaos. This installation is one that will turn into another piece entitled ST. PETERSBURG PARADOX, included in a group exhibition of the same name, opening at the Swiss Institute in New York, in late May. This is a space where logic stumbles and falls, as if the material architecture of reason and sensibility was turned into a city of ruins by its very symbol. Ortmeyer seems to take pleasure in the humor of “noble representation.” In one cluster of oversized carved marble pieces in KISH KUSH, a large knight peaks out of the grouping, calling to mind instead its counterpart, the knave, used in the classic logic problem for its undying attachment to deception. Contrary to the character of the knight, which always tells the truth, the knave’s consistency in providing false answers contains at least some faction of honesty. Indeed, while Ortmeyer depicts one figure, its inverse is always present – picturing a faltering sense of motive, both literally and figuratively, off the grid. Sarah Ortmeyer, installation view (detail) SCHAAK SHOW, S.M.A.K., Gent, Belgium, 2012. ST. PETERSBURG PARADOX, curated by Simon Castets, opens at the Swiss Institute on May 27, 2014. Thierry de Duve, Kant After Duchamp, October books. In conversation with Amber Renaye. April 25, 2014 | Filed under Art Seen: International and tagged with Dvir Gallery, KISH KUSH, S.M.A.K, SARAH ORTMEYER, Stephanie Cristello.